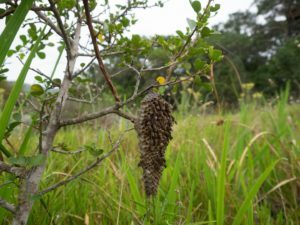 A wasp nest spotted in Steenbok Nature Reserve. These nests are different from the bees, which produce a waxy substance to create theirs. Wasps chew scraped wood fibers and create more papery nests for themselves. Unlike bees, wasps can sting an individual repeatedly. This is why you should stay away from this insect and refrain from angering them, especially social wasps. Social wasps release a pheromone that emits a signal when they are upset. This pheromone is their cry for help, making other wasps become more aggressive. This means that if you anger one of them, their whole colony will come to that lone wasp’s defense!